JD(S)' G T Deve Gowda- the giant slayer who defeated former CM Siddaramaiah in Chamundeshwari with a landslide margin- were sworn in amid loud cheer by supporters. BENGALURU: After weeks of stormy meetings, hectic lobbying and amid heartbreak of many legislators, the first cabinet of ministers of JD(S)- Congress coalition government took oath on Wednesday. JD(S)' H D Revanna was the first to take oath as cabinet rank minister on Wednesday followed by R V Deshpande of the Congress. Bandeppa Kashempur of the JD(S), D K Shivakumar of the Congress, JD(S)' G T Deve Gowda- the giant slayer who defeated former Chief Minister Siddaramaiah in Chamundeshwari with a landslide margin- were sworn in amid loud cheer by supporters. K J George of the Congress, D C Thamanna, former agriculture minister Krishna Byregowda, Mallappa Channaveerappa Managuli, the 82-year-old who the Sindgi seat in Bijapur for the JD(S), N H Shivashankara Reddy- former deputy speaker of the Karnataka Legislative Assembly- were sworn in as ministers. JD(S)' S R Srinivas- legislator from Gubbi will be a minister in the new cabinet. Congress has chosen prominent ST face Ramesh Jarkiholi over his brother Satish- who was instrumental in Siddaramaiah's win in Badami seat. Venkatrao Nadagouda- JD(S) legislator from Sindhanur has been chosen over senior MLC Basavraj Horatti. Former IT&BT minister Priyank Kharge was inducted into the new cabinet. JD(S)' strongman in Mandya C S Puttaraju- who resigned from his MP post after winning from Melukote seat- was sworn in as a minister on Wednesday. U T Khader- the sole Congress legislator from Dakshin Kannada, Sa Ra Mahesh of the JD(S), B J Zameer Ahmed Khan- who quit the JD(S) to join the Congress was inducted in a cabinet led by H D Kumaraswamy. He was the sole minister to take oath in English. N Mahesh- the sole legislator of BSP took oath in the name of Buddha, Basava and Dr B R Ambedkar. Shivanand Patil, a prominent Lingayat face from Basavana Bagewadi who the BJP allegedly tried to poach was also sworn in as a minister. Venkataramanappa- MLA from Pavagada, Rajashekhar Patil from Humnabad- another legislator that the BJP allegedly tried to poach was also inducted into the cabinet. Puttaranga Shetty- MLA from Chamarajanagara, R Shankar- an independent who defeated former Legislative assembly speaker and Congress leader K B Koliwad took oath as ministers. Congress MLC Jayamala Ramachandra- is the sole woman in the cabinet. 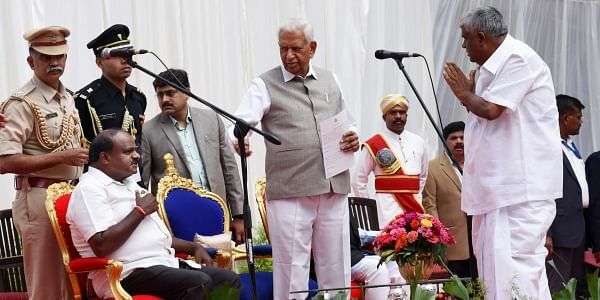 The swearing-in ceremony held at the glass house of the Raj Bhavan was presided over by Governor Vaju Bhai Vala in the presence of Chief Minister H D Kumaraswamy and Deputy Chief Minister Dr G Parameshwara. The oath-taking ceremony took place even as supporters of many senior Congress leaders like H K Patil, M B Patil, Tanveer Sait, Satish Jarkiholi protested at various parts of Karnataka demanding a cabinet berth for them. Leaders like Basavraj Horatti and H Vishwanath of the JD(S) have expressed disappointment over not being accommodated in the first cabinet expansion. "There are many more eligible candidates and they will be considered. We have to take everyone forward. Things are still open and this is just the first phase of the expansion," said D K Shivakumar giving hopes to aspirants left out from Wednesday's swearing-in ceremony. Out of the 34 cabinet berths in the government, the Congress has 22 berths while JD(S) has 12 in their kitty according to the coalition partners' power-sharing formula.